Posts are used for any type of content that is time sensitive or date driven. This can be content such as blog entries, articles, or news stories. Posts are naturally displayed in reverse chronological order and can be organized through categories and tags. Time sensitive information tends to be very social and can encourage conversation through the comments section of the post. When clicking on Posts or All Posts in the main navigation menu, you are taken to an overview of all the posts you have created. This includes both Published posts and Drafts that you may still be working on. The All Posts overview page tells us a great deal of information about our posts. We can see the Title of our post, the Author, which Categories and Tags are assigned to the post, and the number of Comments the post has. 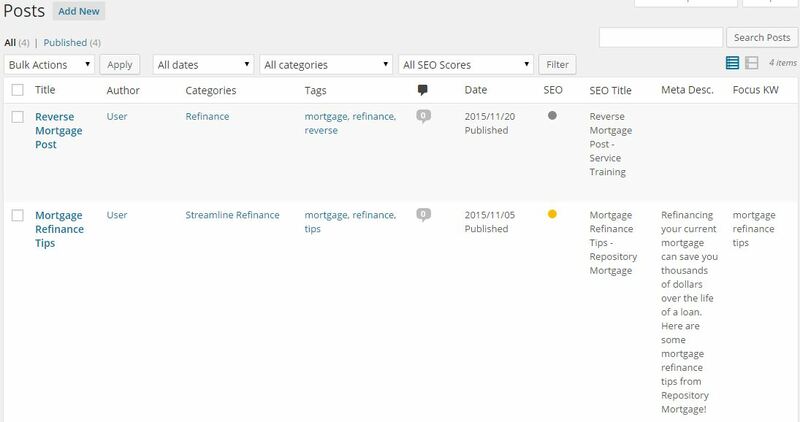 We are also able to see SEO information such as the SEO score (colored circles), the SEO Title Tag, Meta Description, and the Focus Keyword assigned to the post. For more information on managing the SEO tags for your posts, please see our Yoast Plugin guide. If you have a large number of posts, you can filter them by Date, Category, and SEO Score. To do so make your selections from the All Dates, All categories, and All SEO Scores drop down menus and click the filter button. Posts are arranged in reverse chronological order in the admin panel as well. You can change sorting by clicking on column titles such as Title or Author. If you want to find posts on a specific topic, you can also use the search function in the upper right corner of the below image. One of the important features of the All Posts page is the ability to make edits to multiple posts without having to open each individual post for editing. If you hover your mouse over a post, a few hidden options appear below the Title of the post. These options are Edit, Quick Edit, Trash, and View. Edit will take you directly into the post so that you can make changes to the content of the post. Trash will move the post to the trash folder. View will take you to the post on your website. Quick Edit will open a new section on the current page where you can make edits to many aspects of the post. Once the Quick Edit window has opened, you can update the Title, Slug, Date, Author, Categories, and Tags. Slugs are URL friendly page titles used in your page links. It is important to keep the formatting as you see it below with all lowercase letters, separated by dashes, and no spaces. You can password protect the post, or make it private, allow or disallow comments and pings, and update the status of your post. Pings notify blogging sites that you have added a new post. For more information on Pings, please contact our Advanced Marketing Team. Lastly you can make the post a sticky post. As mentioned earlier, posts are displayed in reverse chronological order. If you have a dedicated blog page, you can make use of sticky posts. Sticky posts appear at the top of the blog page, ahead of those ordered by date. Once you’ve made changes to your post, be sure to save them by clicking Update. The Bulk Edit option allows you to delete or edit multiple pages at once. To make Bulk Edits, click the check box next to the posts you wish to change, select Edit from the Bulk Edit drop down, and click Apply. The below window will open and from here you can make edits to Categories, Tags, Author, Commenting, Post Statuses, Pings, and Stickies. Changes made to categories and tags are additive and will not overwrite existing information. If you no longer need to make Bulk Edits to a certain page, click the X next to that page Title to remove it and continue with your edits. Again, be sure to save your changes by clicking Update.